Did you know that women were allowed to vote in Sweden in 1718? (though it was rescinded shortly thereafter in 1772). During the short lived “Age of Liberty” in Sweden, landholding-women were provided limited opportunities to vote! Officially, however, the first “self-governing” country to open voting to all women without any conditions was New Zealand in 1893, 27 years prior to the ratification of the 19th Amendment in the United States. This year, Women’s Equality Day coincides quite well with many of us heading back into the classroom for another great year of teaching and learning. Today, I will present five excellent ways for you to incorporate Women’s Equality Day into your instruction using both Techbook and a variety of online resources. ONE: Analyzing Primary Images that incorporate conflicting viewpoints of women as equals in society: I recommend using this Library of Congress resource to guide your planning and work with students. In it, students are asked to observe, reflect, and create questions about each primary source (for a more detailed and in-depth avenue to analyzing images and specifically cartoons, definitely check out this Techbook Source Analysis Tool. It provides an excellent structure by which students can analyze collaboratively). Reference: A 1909 cartoon from Azerbaijan’s Molla Nasreddin, critical of contemporary attitudes towards women. In the top panel, a father welcomes the birth of a son; while in the bottom panel, he responds to the birth of a girl. Using the above image could be a great way to discuss viewpoints on how females in society are treated (especially in some non-western societies). What do you see in this image? How are the people reacting to the boy being born? The girl? Why do you think they reacted this way? What part of the world do you think this image was created? During which time period do you think this image was created? After students have had this discussion and have had the opportunity to record their ideas, provide the context (from the reference above): A 1909 cartoon from Azerbaijan’s Molla Nasreddin, critical of contemporary attitudes towards women. 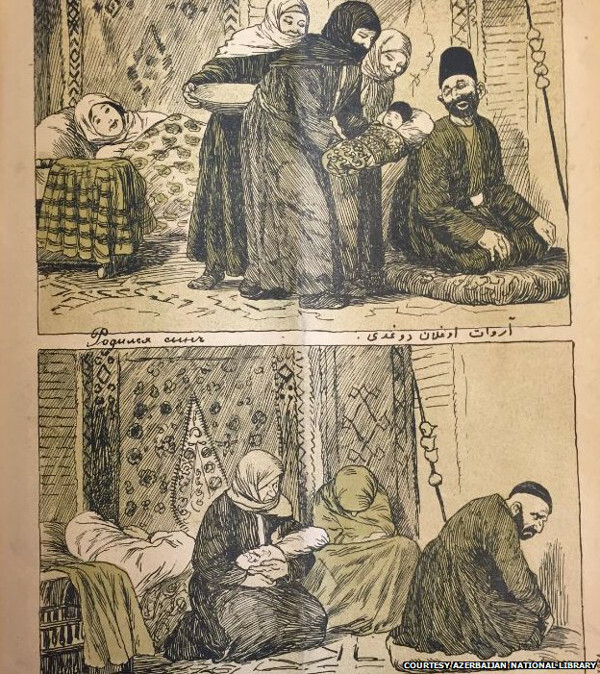 In the top panel, a father welcomes the birth of a son; while in the bottom panel, he responds to the birth of a girl.” Further context is that the publication known as “Molla Nasreddin” was a very progressive and provocative magazine in the early 1900s. It was only around for about twenty-five years before it was shut down. Throughout its existence, they were raided by police and frequently harassed by the state and fellow citizens because of its “racy” content. TWO: Use the following the resources from Unit 6.2 on the Roaring Twenties or the Unit 10.4 “Expanding Rights” section within the U.S. History (Civil War – Present) area of Techbook. The “Say What” activity, students translate the inaugural speech from President Coolidge. Through this activity, students will have to use and interpret primary and secondary sources to understand the challenges that citizens were worried about at the time. Finally, you can use the “Classroom Debate” activity where students analyze a variety of viewpoints during the 1920s. These viewpoints range from whether it was most definitely a decade of progress, or whether it certainly was not a decade of progress (and even made our civilization worse). For additional structures on debating, check out my previous post on Debating the Fourth of July. For Unit 10.4, you can go in even more depth than the above resources. Within this lesson sequence, lesson objectives include explaining the changes in women’s roles and exploring the Latino and Native American struggles for civil rights during the 1960s and 1970s. Additionally, you will find great resources for analyzing the struggles African Americans made in the late 1960s. FOUR: From the National Archives website, there are a number of resources that can help facilitate the celebration of Women’s Equality Day. This one is my favorite, entitled “Kaiser Wilson Poster” could be another great incorporation of a discussion regarding the First Amendment, freedom of protest, and general equality. Excerpt found here: During World War I, militant suffragists, demanding that President Wilson reverse his opposition to a federal amendment, stood vigil at the White House and carried banners such as this one comparing the President to Kaiser Wilhelm II of Germany. In the heated patriotic climate of wartime, such tactics met with hostility and sometimes violence and arrest. FIVE: Last year, an article was posted via Time Magazine that explored the following: “Why Britain Has No Women’s Equality Day.” In your classroom, this could be a great way to extend and enrich student discourse and debate within your walls: Why do we use days to celebrate certain groups of people? Why are there debates about designating days and months dedicated to people, groups, and causes? To what extent do designated and celebratory days and months bring people together in a positive way? Are there any current federal holidays that we should not be celebrating? Why? No matter how you present Women’s Equality Day to your students, it is paramount that it is framed in a way that is inclusive and relevant to the struggles we see women make across the world and in some cases within our own country, even today. As you consider how to implement these ideas into your lessons, please share other websites or lessons in the comment section below. About the Author: Casey Siddons is a Consulting Teacher with Montgomery County Public Schools, and a blogger for Discovery Education. Casey has worked for Montgomery County Public Schools in Maryland since 2008 where he taught 6th grade world studies for eight years; five years as a department chair, and joined the Consulting Teacher team in MCPS in 2016. Casey’s current role as Consulting Teacher is to help build the capacity of new and experienced educators. Casey earned a B.S. in Citizenship Education with a concentration in Secondary Education from Kutztown University of Pennsylvania, and is currently earning his M.S. in Educational Leadership from Hood College in Frederick, Maryland.